When the third order of Greek gods took over from their parents, Stephen Fry describes Zeus (Jupiter) as ‘wanting the old management out and his people in.’ Zeus took overall command as supreme leader – lord of the firmament or Sky Father. One of his other names is Cloud-Gatherer. The domains of the sea and the underworld needed leaders, so Zeus, knowing his two brothers, Poseidon and Hades, to be both clever and brave, decided on a lottery to determine to whom these two most important provinces should be assigned. He knew his brothers were less than fond of each other and anyway Zeus loved a gamble. A lottery solved a lot of post-choice headaches for him! Our interest this year is in Poseidon – Neptune to his astrology friends. Hades will get even more of a turn next year. Although Zeus called himself king, grumpy Poseidon kept an eye on him and would act against him if he made too many blunders. Brothers will be brothers! Zeus had thunderbolts as weapons, and he gave Poseidon a great three-pronged trident, which could stir up tidal waves and make the earth tremble. One of Poseidon’s names is Earth-Shaker. Yes, I know you always want predictions at the beginning of the year, which I insist I don’t do. But, even though I prefer my other ones, my posts that hint of prediction are still the most read! So here you are – a flavour for 2019! 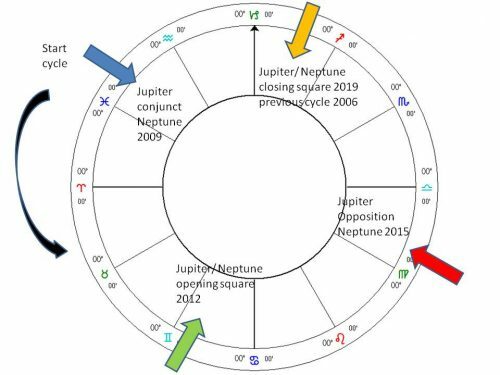 One of the most important planetary meetings this year (in a warm up to 2020 which is a real humdinger) is, as my title suggests, Jupiter in the clinch with Neptune. They meet three times in a square aspect, so their rumblings will be felt all year. Saturn steps in occasionally to add a bit of gravitas, as if we didn’t have enough of that already with a lot of Capricorn again this year. (My last two Capricorn posts from 2018 and 2017 could be pretty much repeated – about Capricorn anyway!) However, I want to concentrate here on the cycle to which this square aspect belongs. Although Neptune is now strong in his own sign of Pisces (since 2012), Aquarius is the seed moment of the current cycle. So at the start of this cycle in 2009, it set the scene for a yearning to be scientific, independent and especially hopeful for the future. In 2009, Obama had just come to power and he received the Nobel Peace Prize. This cycle is really about how two archetypes interact. One way to look at it is to see it as a development of themes relating to these two planets. We can take Neptune areas – shipping, hospitals, drugs – medical and otherwise, refugees, and victims, to name a few, and blast them with Jupiter. This can work in positive or negative ways. The trick is to take the opportunities presented by using them positively. Jupiter expands and takes risks, is entrepreneurial, likes adventures and is good at strategy. So the starting of the cycle is a good time to create a big vision, for example, in how to handle refugees. Or to develop a new strategy for the NHS (the National Health system in the UK). On a personal level it is interesting to look back at 2009 for yourself. Did you take a risk and go for your dreams? Or did you feel hugely victimised (Neptune) at the hands of a greedy or arrogant person (Jupiter)? Negatively speaking, in 2009 we saw the expenses scandal in the UK government, along with the Murdoch phone tapping – risks taken but not for the benefit of many! The other way to contemplate this is that we can take Jupiterian areas and give them a dose of Poseidon’s medicine. Politics and universities are Jupiter’s area, as are lawyers. Neptune glamorises, idealises and confuses. It rules television. Interestingly, in 2009 in the UK, we saw the first ever live TV debates in politics. 2009, in fact on a date very close to the last of the three conjunctions of these two planets, also brought the Treaty of Lisbon into force for the EU. Among changes making the European parliament more powerful, it also, for the first time, gave member states the explicit legal right to leave the EU and the procedure to do so – interesting in the light of what is happening now with Brexit as these planets meet again this month! As we are not at the close of the cycle yet, it may take until 2022 until the EU is done and dusted with Brexit and any other possible leavers. By the time we reached the opening square of this cycle in 2012, Neptune had moved into Pisces – he had come home to his favourite sea bed. I wrote about this at the time in Pisces 2012. The opening square of any cycle is a time to see if the seeds you planted – in this case in 2009, are flourishing. You should weed out the struggling ones so you can have a good harvest at the opposition time. So what did you do in 2012 that helped dreams come to fruition in 2015? As far is the world is concerned, Obama was elected again in 2012 and we saw the 18th Central Committee of the Communist Party of China elect Xi Jinping to the post of general secretary of the Communist Party and chairman of the CPC Central Military Commission. This effectively made him the leader and by 2013 he became President. Mohamed Morsi became president of Egypt, although owing to protests, this lasted for a very short time. Aung San Suu Kyi ran for President in Myanmar, although she was barred from taking that role. Here we see the hope (Neptune) in politics (Jupiter), and also the chaos (Neptune) in Egypt. And in the UK, on the exact date of the square between these 2 planets, an NHS hospital trust was formally warned it could be declared bust and dissolved – the first move of its kind in the health service. Jupiter can over-extend while Neptune disappoints. Regret was expressed in 2015 by the ex-secretary of the Nobel committee, regarding Obama’s Nobel Peace Prize. He stated that giving this award failed to achieve what the committee hoped it would, a sign of dashed hopes (Neptune) on a global (Jupiter) stage. 2015 saw some very sad events, one being the loss of many lives in the Germanwings aircraft piloted by Andreas Lubitz, who deliberately crashed his aircraft into the Alps killing all 150 people on board. This is very indicative of Jupiter (flight), meeting Neptune, (victims and delusions). Maybe this was the harvest from our lack of strategy as to how to deal with mental illness. A second terrorist attack on the Charlie Hebdo magazine killed 12 people, another event indicative of our failures in dealing with different religious beliefs, which are also Jupiter’s responsibility – again we see victims. And, of course, 2015 saw the rise of Donald Trump’s bid for the presidency, and the opposing beliefs at many levels. Neptune and Jupiter meetings create confusion and idealism in politics. With all the unrealistic hope projected onto Obama in 2009, perhaps it was inevitable that the dream was dashed and we headed for the opposite of Neptunian compassion. Zeus and Poseidon is a game – who knew? What did you harvest in 2015? Did any of the seeds you planted in 2009 come to fruition? Or were you over-optimistic or unrealistic? We arrive in 2019 at the closing square. The winter part of the cycle – a time for reflection and thinking about the seeds we want to plant at the start of the next cycle in 2022, still in the sign of Pisces. We should reflect on what we did in 2009 and learn from that, but will we? What are our really big dream seeds? The potential is for true compassion in politics and law and good strategies for real health care, for taking a risk with our feelings, and following through on our intuition, but we have to get through 2019 first! 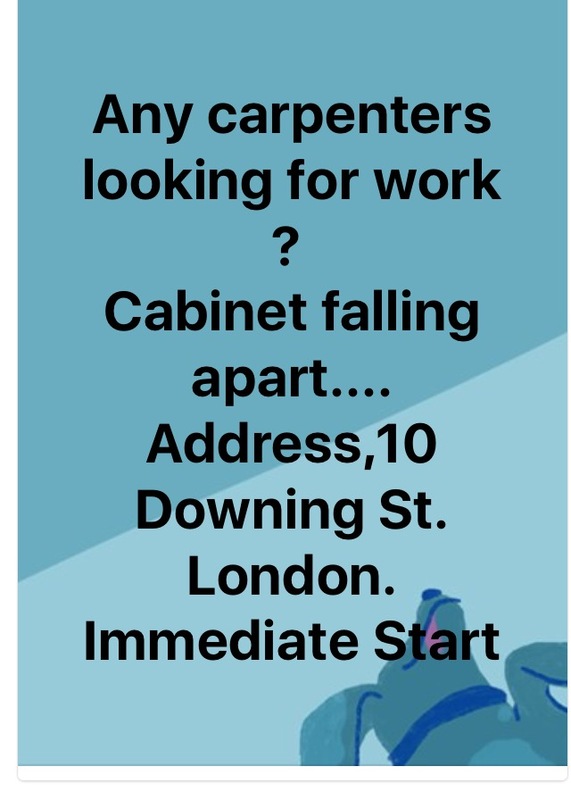 Today, chaos seems to be rife everywhere in politics with Brexit being a case in point. Lawyers, especially where Trump is concerned, are lying. The Gilets Jaunes are active in France, and a large gas explosion added to the mayhem there, resulting in deaths. Many stick to delusional beliefs – fundamentalism is rife with Jupiter in Sagittarius. We don’t know what to believe any more so the only way might be to go inwards – and believe what we discover there. The way politics is working at the moment is creating many real victims. In the US the government has been shut down for the longest period in history. As an outsider, I find it completely incomprehensible that government workers are not paid when this happens. Partly because of Brexit, the NHS is in a confused state, as is all of Europe. Mental health is being severely challenged because of the lack of a strategy. There are still huge problems with refugees globally and we have literally had tempestuous seas and storms. Heavy snow in Europe is causing danger. On a lighter note – and god knows we need one – a robin arrived in Beijing causing a sensation and a flurry of jokes about it being a Brexit refugee! 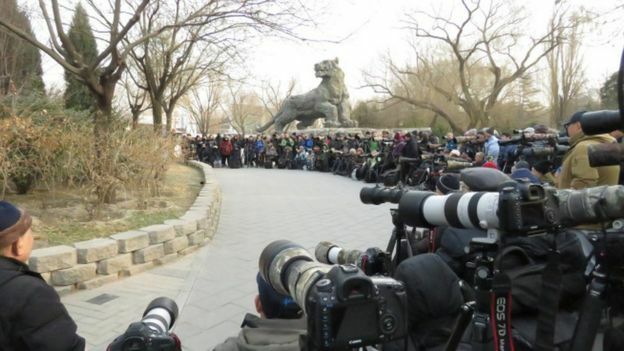 Photographers camped out in Beijing try to capture the perfect shot of the robin! We seem to have a deep longing for something – but what? So what should we do this year? It is time to let go of limiting or fundamentalist views – I know you think that means the other guy, but we need to examine our own prejudices! Go with the tsunami flow – better surfing it than being under it! As the clouds gather and the earth shakes, let go of everything that is holding you back from exploring your path. Then Zeus won’t need his thunderbolts and Poseidon can hang up his trident – although knowing him he’d probably leave it lying around for someone to trip over! Things that actually went right in 2018 – too often we focus on the bad stuff! and something I agree with Politics: time for an era of compassion?